Dave Cunningham '16 had 19 saves on Saturday against Conn. College. 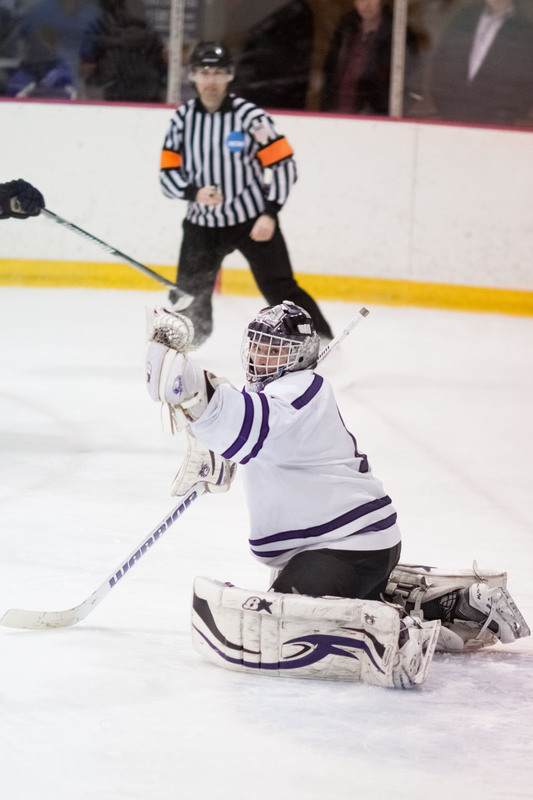 The Amherst men’s ice hockey team had two tough conference games this weekend against Conn. College and Tufts at home in Orr Rink. Though the Jeffs finished the weekend with two 1-1 ties, the team extended their unbeaten streak to 11 straight games, continuing their strong play during the month of February. Both games were marked by strong defensive play on both sides. On Saturday, the Camels were on the ropes early when Topher Flanagan ’16 scored 11 minutes into the first period off a shot from just above the goal line. Mike Petchonka ’14 and Elliot Bostrom ’14 were credited with the assists on the play. In the second period, the defensive struggle continued, as only eight shots hit the net for both teams combined with just two for Amherst. The Jeffs killed three penalties and retained their one goal lead over the opposition. The third period was equally close, but it was the Camels who were able to get one by Dave Cunningham ’16 with 12:48 remaining in regulation. The score ended 40 straight minutes of scoreless action. The overtime period did not provide any spectacular chances for either side, and the game finished in a draw. Sunday afternoon, the Jeffs hosted the Tufts Jumbos in their final home game of the regular season. Amherst seniors were honored for the all their contributions made to the program, as they played their last regular season home game as Jeffs. Tufts, with a 1-14-1 record in league play, still played Amherst tough, but the Jeffs dominated much of the game nevertheless. The defensive theme of the weekend continued with a scoreless opening period and just six shots for Tufts while Amherst had five. It was early in the second period when the Jumbos managed to break the tie when they notched a shorthanded goal just over a minute into the second period. Amherst evened the score soon when Dan Merenich ’15 sent a tape-to-tape pass to Jake Turrin ’15, who used his wheels to outskate the Jumbo defenseman and picked a corner for the score. There were several power play opportunities for both sides, but neither team was able to capitalize as the game headed into overtime. It was the second time in as many days for the Jeffs that the score was tied after regulation. Amherst dominated for the second half of the game, but despite outshooting Tufts 37-16, the contest ended in a 1-1 tie. “We’ve put ourselves in a great position in the NESCAC standings but we’ll have to continue to rely on the work ethic we established in the fall and build on our recent successes. It’s a great feeling to be in a position that you control your own destiny,” said senior captain Andrew Kurlandski. The Jeffs will travel to Middlebury and Williams this upcoming weekend and look to close out their season strongly against two of the more competitive NESCAC opponents.